Lewis played a season-high 22 snaps in Monday's victory over the 49ers but was not targeted. Analysis: Lewis has operated as the Packers' third tight end all season and has been targeted just once through six games. As such, he remains off the fantasy radar for the time being. Lewis played 14 snaps in Sunday's tie with the Vikings but did not catch a pass. Analysis: Lewis worked as the Packers' third tight end in their season opener, and he was back in that role in Week 2, as backup tight end Lance Kendricks totaled 27 snaps and top tight end Jimmy Graham was on the field for 58 plays. Lewis did not catch a pass in Sunday's victory over the Bears. Analysis: It was assumed that Lewis would complement top tight end Jimmy Graham, but that was not the case in the opener, as Lewis was on the field for just seven plays while fellow reserve tight end Lance Kendricks received 19 snaps. For now, consider Lewis depth for the Packers, and a long shot to put up useful numbers in fantasy games. Lewis caught one pass for 23 yards in Thursday's preseason game. 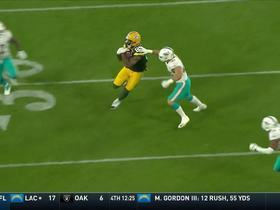 Analysis: Lewis did not record any statistics in the Packers' preseason opener, but he was able to haul in his lone target Thursday and notch his first reception since signing with Green Bay. Lewis had his most productive season since 2013 a year ago, but it will be tough for him to match that production while serving as a backup behind top tight end Jimmy Graham. Lewis signed a contract with the Packers on Thursday, Tom Pelissero of NFL.com reports. Analysis: Lewis played for the Jaguars over the last 12 seasons, consistently showing value as block-first tight end. With Jimmy Graham and Lance Kendricks on the roster as well, Lewis likely doesn't have a high ceiling as far as fantasy value goes. He did catch five touchdowns with Jacksonville in 2017 however, and he may get a few red zone targets if he's able to stick around in Green Bay. 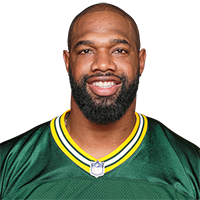 Lewis is expected to visit with the Packers this week, Tom Silverstein of the Milwaukee Journal Sentinel reports. Analysis: Lewis hasn't caught more than 25 passes in any of his last five seasons, but he did snag five touchdowns for a Blake Bortles-led offense in 2017. Regardless, Green Bay is presumably looking to bring him in as more of a blocking-oriented tight end than receiving threat, especially since the team already signed TE Jimmy Graham at the position. The 34-year-old isn't known to have generated interest from any another team this offseason. Lewis was released by the Jaguars on Tuesday. 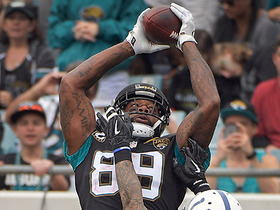 The Jaguars exercised Lewis' $3.5 million team option for 2018 on Tuesday, Ryan O'Halloran of The Florida Times-Union reports. Lewis (ankle) practiced fully Thursday. Analysis: Lewis, who caught all three of his targets for 17 yards in last weekend's playoff win over the Bills, will be a go Sunday against the Steelers. From a fantasy standpoint, Lewis is pretty touchdown-dependent, given that he topped 50 receiving yards just once over the course of the regular season. The tight end did log five TDs in 16 games, but that mark was boosted by an outlier three-TD output on Sept. 24. Lewis (ankle) was limited at Wednesday's practice. Analysis: Lewis caught all three of his targets for 17 yards in this past Sunday's 10-3 win over the Bills. Blake Bortles threw for just 87 yards in the contest, so working in Lewis' favor this weekend is that his QB figures to do some more damage via the air in Sunday's road playoff contest against the Steelers. The tight end is a TD-dependent dart in postseason fantasy formats. Lewis (ankle) does not carry an injury designation for Sunday's playoff game against the Bills. Analysis: Overall, Lewis logged 24 catches (on 49 targets) for 318 yards and five TDs this past season, but his fantasy production was sporadic, with a three-TD output on Sept. 24 representing an outlier effort for the 33-year-old tight end. Lewis (ankle) returned to a limited practice Thursday. Analysis: We'll have to see if the tight end ends up with an injury designation for Sunday's playoff game against the Bills, but we'd expect him to suit up this weekend, in any case. The 2006 first-rounder finished up the 2017 season with 24 catches (on 49 targets) for 318 yards and five TDs, three of which Lewis logged on Sept. 24. Lewis (ankle) isn't in line to practice Wednesday, John Reid of The Florida Times-Union reports. Analysis: Lewis' practice time was limited last week due to the same injury, but he ultimately suited up for a mostly meaningless regular-season finale against the Titans and played 53 snaps in the loss. With no reported aggravation to the ankle during that contest, it's likely that Lewis is just being held out Wednesday for maintenance purposes. He should be good to go for Sunday's wild-card matchup with the Bills. Lewis (ankle) doesn't have a designation for Sunday's game in Tennessee. Analysis: Lewis has dealt with injuries at various points this season but hasn't missed a game to date. He won't break the streak this weekend, either, despite following a limited/DNP/limited practice regimen this week. 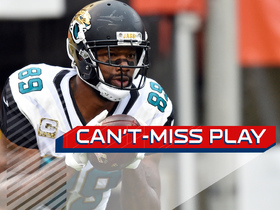 Nonetheless, there's a chance Lewis gets some rest Sunday with the Jaguars locked into the No. 3 seed in the AFC playoffs, which would allow James O'Shaughnessy and Ben Koyack to get some run. Lewis (ankle) failed to practice Thursday. Lewis is expected to be listed as a non-participant in practice Wednesday due to an ankle injury, Michael DiRocco of ESPN.com reports. Lewis (shoulder) does not carry an injury designation for Sunday's game against the 49ers. Analysis: Lewis will be out there if you need him this week, but the veteran tight end has been a hit-or-miss fantasy option of late, with just two catches (on four targets) for 18 yards combined over his last two outings. Overall, Lewis has hauled in 21 catches for 283 yards in 14 games, with three of his five TDs this season having occurred in a random Week 3 outburst. Lewis (shoulder) practiced on a limited basis Thursday. 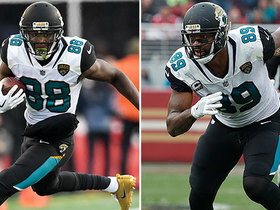 Analysis: It amounts to a step forward for the tight end, who was held out entirely for the Jaguars' first practice session of the week. The Jacksonville coaching staff has offered no indication that Lewis' shoulder issue is a major concern, so it seems likely the 33-year-old is just getting some late-season maintenance this week. Expect him to start Sunday's game against the 49ers and take on his usual load of snaps. Lewis (shoulder) didn't practice Wednesday. Analysis: Lewis has been a hit-or-miss fantasy option this season, with three of his five TDs having occurred in a Week 3 win over the Ravens. 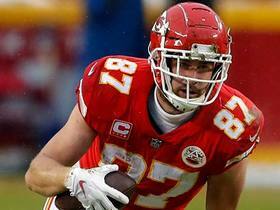 His status will be monitored leading up to Sunday's game against the 49ers, but now that he's hurting, the tight end is looking like more of a fantasy dart than usual in Week 16. Lewis isn't expected to practice Wednesday due to a shoulder injury, Mike Kaye of FirstCoastNews.com reports. Analysis: This is the first report of a shoulder injury for Lewis, so both the origin and extent are unclear. However, it leaves his status in question for Sunday's game against the 49ers. The Jaguars will provide an official update on Lewis' status after Wednesday's session concludes. 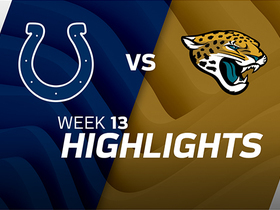 Lewis snagged four of five targets for 46 yards during Sunday's 30-10 win over the Colts. Analysis: The catch total tied a season high for Lewis. The veteran tight end has not been much of a receiver in recent seasons but is showing some consistency as of late. He has either scored or topped 40 yards in four of his last six games. Paired with his stranglehold on the starting job, seeing the field for 56 of 66 offensive plays on Sunday, Lewis is becoming a weapon to be reckoned with in Jacksonville. Lewis had one catch for 10 yards in Sunday's loss to the Cardinals. Analysis: Lewis blew up in Week 3 with four catches for 62 yards and three touchdowns, but he's been mostly an afterthought in the weeks since, notching no more than two catches in seven of his last eight games. The 33-year-old has been targeted only four times in the last two weeks combined by quarterback Blake Bortles, who attempted 33 passes Sunday. Lewis reeled in both of his targets for 26 yards and a touchdown in Sunday's 19-7 win over the Browns. 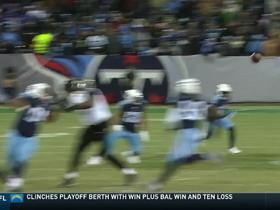 Analysis: Lewis faked as though he was blocking on a play-action pass in the first quarter and then slipped out for a 10-yard touchdown, the Jaguars' first score of the game. The touchdown was Lewis' second in the past four games and fifth of the season -- the second most of his career. Even though Lewis ranks just sixth on a bottom-10 passing team in catches, he has three more touchdowns than any other Jaguar target. His production is getting hard to ignore. Lewis (knee) doesn't carry an injury designation heading into Sunday's game against the Browns. Lewis (knee) was a limited participant in Thursday's practice. Analysis: The Jaguars have monitored Lewis' practice reps through the first two days of the week, but there has been no indication from the team that the knee issue will put the tight end's status in jeopardy for Sunday's game against the Browns. Since his three-touchdown outburst in Week 3, Lewis has managed only eight catches for 121 yards and a touchdown in his subsequent six appearances, rendering him a lower-tier fantasy option at the position. Lewis was limited at Wednesday's practice with a knee injury, Nate Ulrich of the Akron Beacon Journal reports. Analysis: It's apparently a new ailment, as Lewis hasn't been listed on the injury report since he dealt with a minor shoulder injury Week 7. He logged 92 percent of the offensive snaps in Sunday's 20-17 win over the Chargers, catching two of five targets for 29 yards. Lewis hasn't topped three catches or 49 yards in any contest since his shocking three-touchdown explosion against the Ravens back in Week 3. Any limitations likely would impact the Jacksonville rushing attack more than the passing game. Lewis nabbed two of five targets for 29 yards in Sunday's 20-17 win over the Chargers. Analysis: Lewis has now caught multiple passes in three straight games after just one such performance in the seasons' first six contests. 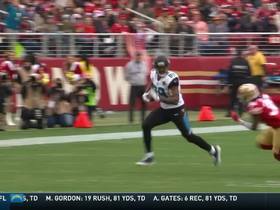 The big-bodied target has shown some swiftness in the Jaguars' most recent contests with a catch of at least 20 yards in all three. He's still a tough start given the Jaguars' typically run-focused ways. 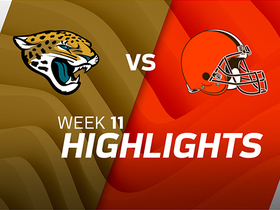 Lewis caught three of six targets for 49 yards in Sunday's 23-7 win over the Bengals.